After an action-packed season in 2018, the National Enduro Championship is about to make its grand return. On Saturday, 23 March, the country’s best will go to battle in New Hanover – a small town in the midlands of KwaZulu-Natal. After a testing season riddled with injury, fans have waited in anticipation for the return of the Natal-based Scott Bouverie. The Brother Leader Tread KTM rider is a household name in the South African world of hard enduro. Take one look at his list of credentials, and Bouverie has ticked off most things on every enduro rider’s bucket list. He’s stepped onto the Roof of Africa podium twice in his career, finished third in the coveted Red Bull Sea to Sky, and placed fifth in Red Bull Romaniacs. He also managed to add his name to the handful of riders that conquered Erzbergrodeo in 2017. Fast forward to 2019, and Bouverie is about to make his comeback. There is a national title that has eluded his grasp, and the rider is about to start the hunt for the E2 Championship. “Difficult times have built me as a rider and taught me to ride within my limits. I’ve put the disappointments behind me and I’m ready to build my confidence back up race by race. It’s really good to start the season in familiar Natal terrain this weekend,” said Bouverie. His Brother Leader Tread KTM teammate Dwayne Kleynhans is on the same comeback path. The rider was on the cusp of snatching up the E1 Championship last season, but an unfortunate arm injury kept him from national glory. While he seemed to have fully recovered at the Roof of Africa in December, he realized that something still wasn’t right at a practice race earlier this year. “I had to go for surgery again, but with just enough time to recover for the first national. It’s going to be tough because I haven’t had the time on the bike that I would have liked leading up to this. I’m grateful to be able to race and get some points though - I’ll just dig deep and go into the memory bank!” said Kleynhans. Stepping into one of the most important seasons of her career is Kirsten Landman. At first glance, it might seem like Landman has reached the pinnacle of her career in South Africa. 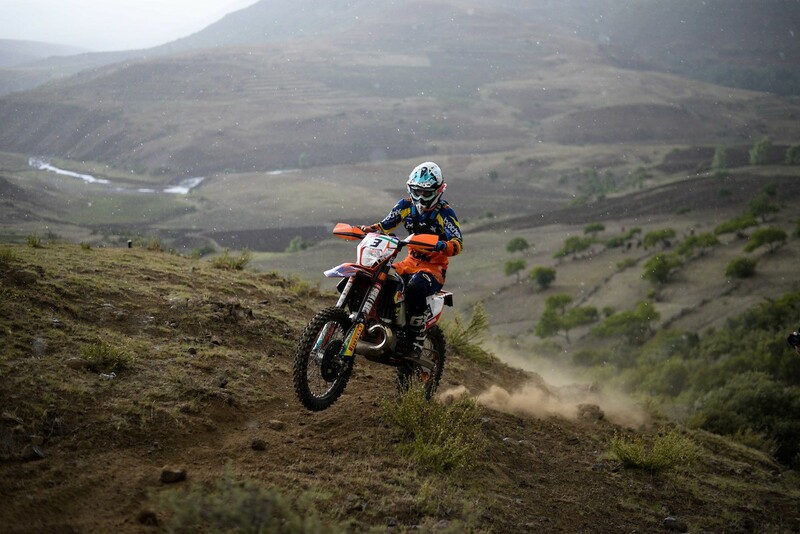 Having achieved everything there is to achieve locally, Landman boasts titles like the first woman to finish Gold at the Roof of Africa and the 2017 National Enduro Silver Class Champion. Rounding out the orange team is new recruit Bradley Cox. The son of motorsport legend Alfie Cox has fast become an ever-looming threat to his competitors with a talent in Motocross, Enduro and Cross Country. In 2018 he finished fifth overall in the National Enduro E1 Class and after being signed by Brother Leader Tread KTM will be more determined than ever. As no stranger to Natal’s rugged terrain, the rider will certainly have a target on his back this weekend. “It’s so good to kick off the enduro season so close to home! Last year was a very good building year for me, and I’m starting to prove that I’m one of the few riders in South Africa that can race all three disciplines. I split up my training really well, and have a fitness coach that helps me. So I’m feeling really confident in my preparations for this event…” explained Cox. Picture Caption: Scott Bouverie at the 2018 Roof of Africa.